This easy Slow Cooker Beef Chili is loaded with flavor and perfect for dinner and game day! 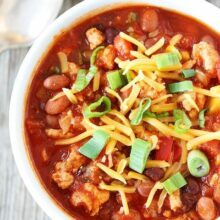 You will love this hearty chili recipe, it is guaranteed to be a family favorite! 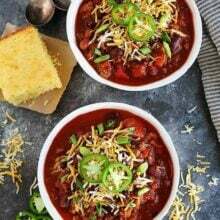 You guys are always asking for easy slow cooker recipes and today we have the BEST Slow Cooker Beef Chili recipe for you. It is SO easy, the crockpot basically makes dinner for you. You can’t beat that! Slow cooker dinner for the WIN! This is the best set it and forget it chili recipe. This is the perfect recipe for busy weeknights, you can add all of the ingredients to the slow cooker in the morning and have dinner waiting for you when you get home. Josh makes this chili all of the time when it starts getting cold outside. Chili is always a good idea during the fall and winter months, it is hearty, comforting, and will warm you right up! We love slow cooker recipes because they basically make themselves. 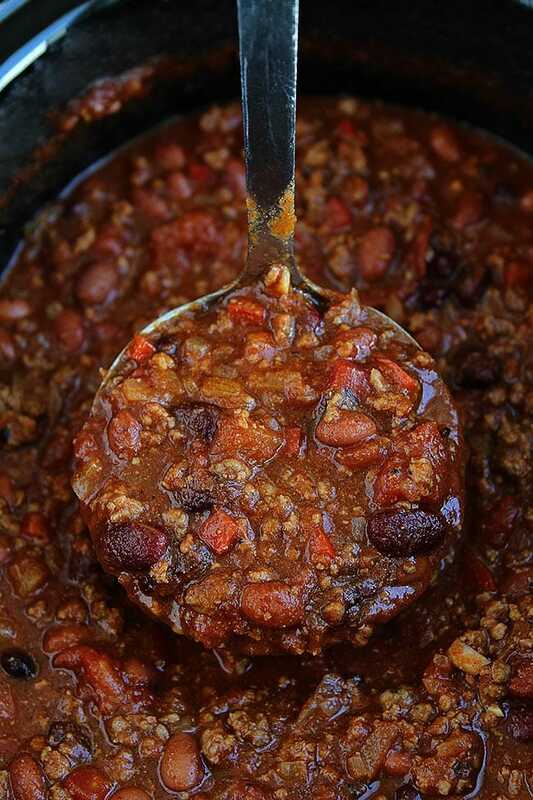 There are only a few steps to making this hearty and delicious chili! It is going to be your GO TO chili recipe! First, brown the beef with the onion and garlic. I know browning the meat takes a little more time, but it really does make a difference when making slow cooker chili. If you don’t brown the meat, the meat will clump together and add lots of grease to the finished chili. So take a few extra minutes to brown the beef and make sure you drain off the excess grease. Pro tip-don’t pour the grease down the drain. Pour it into an old container and let it cool, then throw it away in the garbage. If you have a slow cooker that has a sauté function, you can brown the meat in the slow cooker. We like this one. Once the beef is browned and drained, you can add all of the ingredients to the slow cooker. Make sure you use a 6-quart size or larger. For this chili recipe, we like to use fire roasted tomatoes and regular diced tomatoes. The fire roasted tomatoes add great flavor. 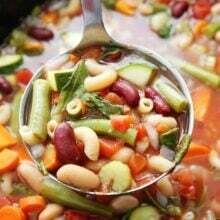 We use dark red kidney beans and small red beans, but feel free to use all kidney beans or you can even use black beans or pinto beans. The key to GOOD chili is making sure you have enough seasonings, especially chili powder and cumin. You can use 2 to 3 tablespoons of chili powder, we always use three. If you aren’t sure, start with two and taste when the chili is done cooking. You can always add more at the end. Josh likes to add a little pure maple syrup to the chili. It doesn’t make the chili super sweet, but helps balance out the acid in the tomatoes. You could also use brown sugar. You can cook the chili on low for 6 to 8 hours or on high for 3 to 4 hours. Make sure you put the lid on the slow cooker while it is cooking. 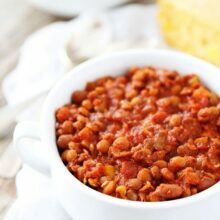 Slow cooking is the perfect way to cook chili because all of the flavors come together while the chili is cooking in the crockpot slowly. When the chili is done cooking, give it a good stir and taste. Add more salt and seasonings, if necessary. Josh also likes to stir in tamed jalapeño slices. They aren’t super spicy, but add a nice flavor. This crockpot chili is also great for easy entertaining, especially on game day! 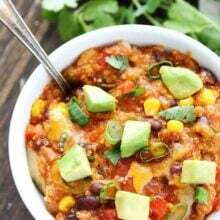 Invite all of your friends over to watch the game and serve up this easy slow cooker chili! It is always a hit and everyone LOVES it! Plus, everyone can customize their own bowl of chili by adding their favorite toppings! And make sure you make a pan of our favorite easy cornbread to go with the chili. 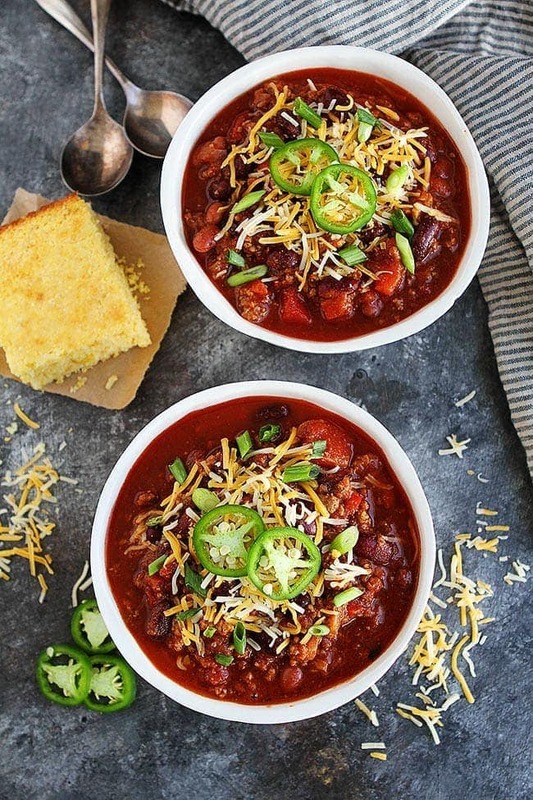 Chili and cornbread are a match made in heaven! You can’t go wrong with that combo! You guys are going to love this chili recipe, it will be your GO TO! You will love how easy it is to make, thanks to the slow cooker and it feeds a crowd. If you don’t have a crowd to feed, don’t worry, you can freeze the chili. Let the chili cool completely and put in a container and freeze for up to 2 months. It is always nice to have dinner in the freezer when life gets busy. 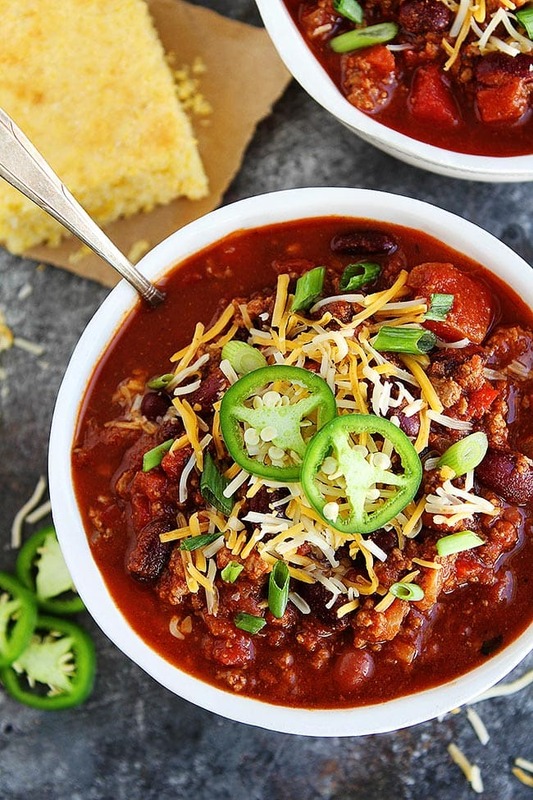 Get out your slow cooker and make chili for dinner tonight! 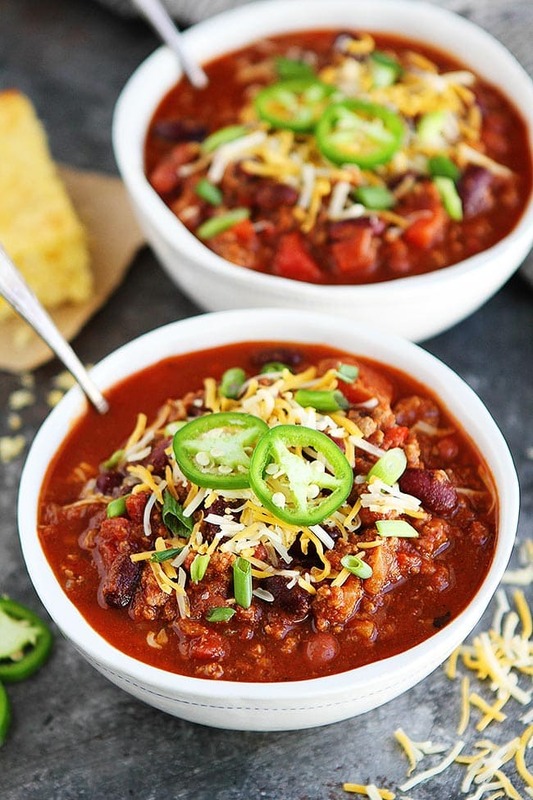 This easy slow cooker chili is the perfect meal for a cold day! Serve with cornbread and your favorite toppings! Chili toppings for serving: shredded cheese sour cream, sliced green onions, jalapeño slices, cilantro, avocado, etc. In a large skillet, heat the oil over medium heat. Add the onion, ground beef, and garlic; cook, using a wooden spoon to crumble the meat as it cooks, until no trace of pink remains, about 5 to 8 minutes. Drain the grease liquid from the pan and discard. Place the cooked beef, onion and garlic into a 6-quart or larger slow cooker. Add the red pepper, beans, fire roasted tomatoes, tomatoes, tomato sauce, beef broth, chili powder, cumin, paprika, salt, cayenne pepper, and maple syrup, if using. Remove the lid and stir in the tamed jalapeño slices, if using. Taste and season with additional salt and seasonings, if necessary. Ladle the chili into bowls and serve with desired toppings. just a little correction on No. 3 in the directions — should read high 3 to 4 hours. I really like your work– Thank you. Thanks for catching that! Fixed! oh yeah chili, what a great reminder for one of my favorite dishes, thank you for this recipe!